Who says less is more? The 'Bronwyn' Satchel by Elaine Turner is a pleated leather satchel, with a front zip pocket, leather strap trim, custom gold crown rivets and chain detail. With so many trends in one, you wouldn’t expect such a chic bag. 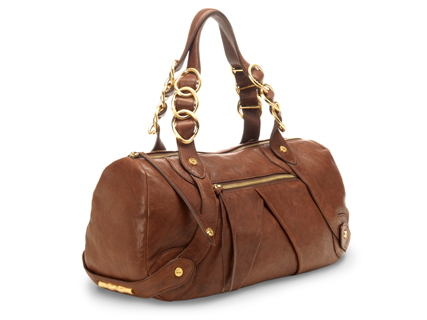 But the Bronwyn is the perfect choice for and everyday bag. Simple and subtle, the pecan-colored distressed leather will blend nicely with your entire wardrobe, and the multi-details give it a bit of a trendy appeal without going overboard.